This year more than 20 million Americans will become victims of crime. Very few will get the help they need to get their lives back on track. Parallel Justice for Victims of Crime presents a new approach, designed to help victims rebuild their lives – now being piloted from Vermont to California – by police chiefs, prosecutors, corrections officials, victim advocates and community leaders. Drawing on more than 30 years of criminal justice experience, including almost 8 years as executive director of the National Center for Victims of Crime, author Susan Herman explains why justice for all requires more than holding offenders accountable – it means addressing victims’ three basic needs: to be safe, to recover from the trauma of the crime, and regain control of their lives. 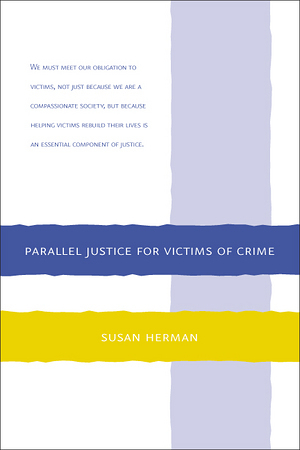 With guiding principles and practical examples of how to respond to victims of any kind of crime, Parallel Justice for Victims of Crime provides a roadmap for everyone who wants to pursue this new vision of justice. Standard discounts for Bookstores apply.